Dominic Solanke scored twice as Academy players from Premier League clubs helped England book a place in the FIFA Under-20 World Cup final. 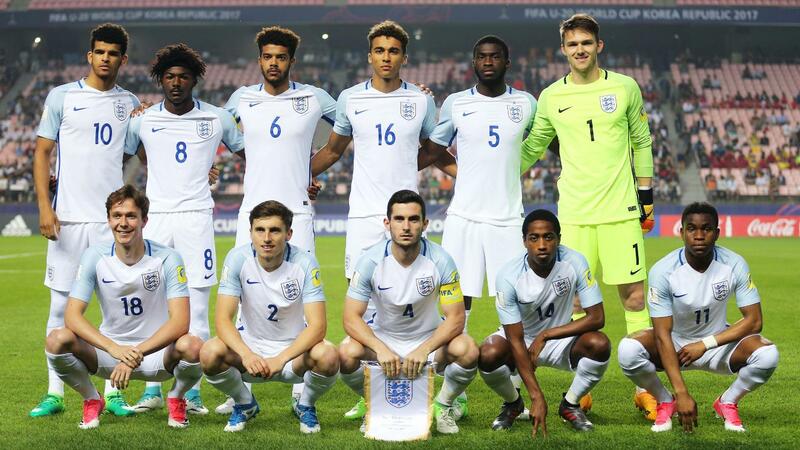 Solanke, pictured centre above, took his goal tally in the tournament to four as England came from behind to beat Italy 3-1 at the Jeonju Stadium, in South Korea. The forward is set to join Liverpool from Chelsea next month. Everton's Ademola Lookman also scored for a squad featuring players from eight Premier League clubs, including Premier League 2 stars such as Tottenham Hotspur's Kyle Walker-Peters, Everton's Kieran Dowell and Liverpool’s Sheyi Ojo. England will play Venezuela in the final on Sunday. England (back row from left) Dominic Solanke (Chelsea), Ainsley Maitland-Niles (Arsenal), Jake Clarke-Salter (Chelsea), Dominic Calvert-Lewin (Everton), Fikayo Tomori (Chelsea), Freddie Woodman (Newcastle United); (front row from left) Kieran Dowell, Jonjoe Kenny (both Everton), Lewis Cook (AFC Bournemouth), Kyle Walker-Peters (Spurs), Ademola Lookman (Everton). Substitutes Sheyi Ojo (Liverpool) for Dowell, Ezri Konsa (Charlton) for Lookman. Not used Dean Henderson (Man Utd), Luke Southwood (Reading), Callum Connolly (Everton), Adam Armstrong (Newcastle), Dael Fry, Harry Chapman (both Middlesbrough), Ovie Ejaria (Liverpool).